-Upper material: 100% nylon fabric. Color may be a little different due to computer monitor setting, please understand! We promise to provide the best customer service and respond emails within 24 hours. If you have any questions, please feel free to email us! 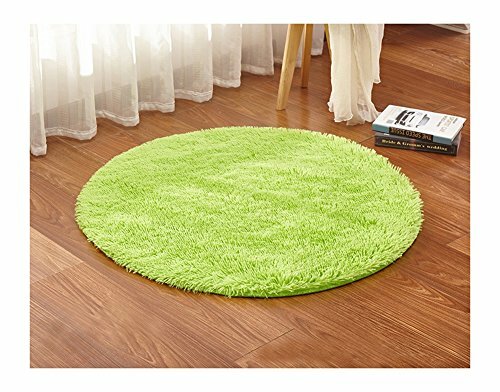 SUPER SOFT: Covered with thick and long microfiber fur, the mat will relieve foot fatigue and will protect your feet from the cold and hard floor. You really need to feel the softness on your bare feet. Be confident when you baby crawling or kids playing on the mat. ANTI SLIP DESIGN: Benefit anti-skid latex dotted backing, it helps prevent the rug from sliding on the floor. Giving babies, pregnant women and elders intimate care and protection. WATER ABSORBENT AND FAST DRY: Super-absorbent fabric soaks up water like a sponge, and the mat's construction allow the water dry quickly, leaving the mat clean and dry. You don¡¯t worry about spilling the water on it. WIDE VERSATILITY: Decorative Rugs in beautiful colors. It can be put under computer chairs, coffee table, dining table, bedroom, study room, by the bed, the hallway, bedroom, entryways, etc. It's soft and cozy for you to perform your daily yoga. EASY TO CLEAN: DO Not WASH IT BY MACHINE. Hand wash for easy care and flat dry. Do not bleach. If you have any questions about this product by KAMA BRIDAL, contact us by completing and submitting the form below. If you are looking for a specif part number, please include it with your message.